I’ve been playing it for years, so I’m glad Eden is now up on Kickstarter and approaching release! That story about bears getting framed for murder? Yeah that was the first time I played. There’s a fun and very interesting thing that happens when you play Eden that I really haven’t seen in other games. In most role-playing games, each of us is playing our own character. We don’t play the same people, except in rare cases like Downfall, where we rotate characters, or sometimes in Microscope if we bring the same characters back in multiple scenes. 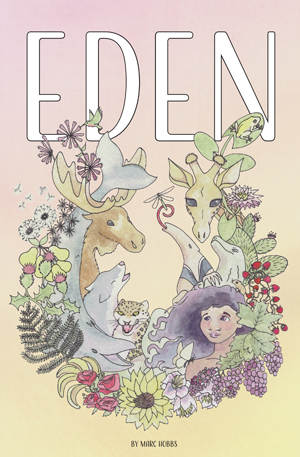 In Eden, we each have our own character, and each character has a particular species of animal that is their special friend. Those are the animals that you go to when you need advice, which means you’re often getting terrible relationship advice from a pack of squirrels, which is hi-larious. The interesting thing is what happens when we role-play those “talking to animals” scenes. Usually one person is playing their character, and the rest of us are all playing animals of their favorite species: we’re all raccoons, or giraffes, or panthers. So that’s one person talking to three raccoons, and so on. Normally when you role-play, each person at the table is playing someone different, so we’re all trying to be different, to highlight the nature of our character. It’s basically the job. But in Eden, when a bunch of us are playing raccoons, we start trying to play exactly the same. Someone talks a certain way, or shows a particular attitude, and the other players embrace and imitate it. We’re all trying to synchronize how raccoons act. There’s nothing in the rules that says to do this, and there’s no discussion at the table. It just happens organically, which is fascinating. I’ve seen it over and over again with a whole host of different animals. Species that everyone groks and that are easy to stereotype are the best. Bunnies or wolves are a cakewalk. Turtles? Sharks? Ants? Perfect. It’s harder when we play more exotic animals or those with fewer obvious stereotypes. We all know what armadillos are, but we might not be on the same page about how armadillo’s talk or what they think. That’s Eden: check it out.